On 15 November, the International Institute of Los Angeles is celebrating its centennial and this is the third post commemorating that event by featuring some history related to the early days of the Institute when it was located in the former William H. Perry home, now at Heritage Square Museum. 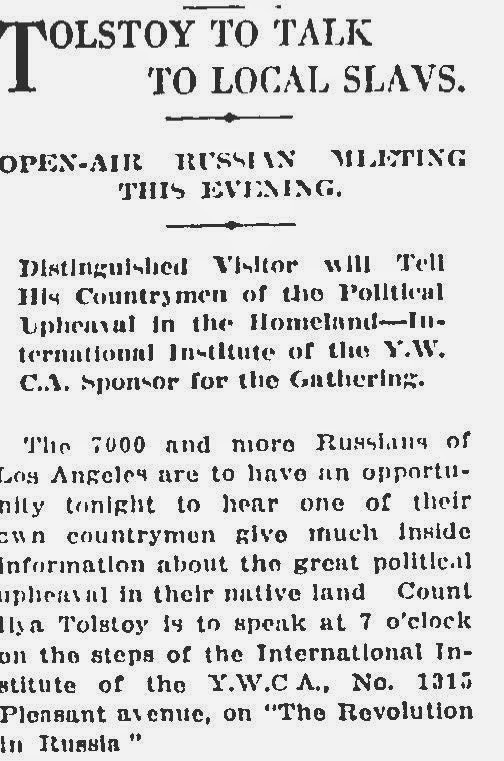 The headline and first paragraph of a Los Angeles Times article of 23 March 1917 on an upcoming lecture by Count Ilya Tolstoy on the Russian revolution of March 1917 at the International Institute of Los Angeles, then occupying the William H. Perry mansion in Boyle Heights. From the Times archive Web site. This entry concerns a notable event in the infancy of the organization: a free lecture given by Count Ilya Tolstoy, son of the famed writer Leo Tolstoy, creator of War and Peace, Anna Karenina and other works, who died in 1910. The younger Tolstoy embarked in December 1916 on a speaking tour of the United States to discuss his famed father and was in Los Angeles when he made an unscheduled free appearance on the steps of the Perry mansion on 23 March 1917. It's worth pointing out here that Europe was bogged down in its fourth year of the so-called Great War, later known as World War One, and the United States was only a few months away from entering the battlefield. Moreover, just a few weeks prior to Tolstoy's lecture, Tsar Nicholas II and his government were toppled by a revolution that led to a provisional government with power-sharing by members of the Duma (Parliament) and Bolshevik socialists that lasted until the October revolution in which the latter seized control of the nation. Consequently, Ilya Tolstoy's address was on "The Revolution in Russia" and an article in the Los Angeles Times from the 23rd noted that many of the 7,000 native-born Russians in Los Angeles were expected to attend. The paper went on to report that "yesterday and today all the Russian students at the institute made a house-to-house canvass of the Russian settlement, telling of the meeting . . ."
The previous decade had, in fact, included an explosion in the numbers of migrants from Russia, especially Molokans, who were dissenters from the Russian Orthodox Church and who were persecuted by the Tsarist government. In the area of Boyle Heights called "The Flats" between the Los Angeles River and the Paredon Blanco (white bluffs), the Russian community established itself in significant numbers during the 1900s and 1910s. Interestingly, the Times piece observed that, "the institute has just planted its front yard to potatoes, but the managers stated yesterday they would sacrifice the valuable tubers for the purposes of giving the local Russians opportunity to hear a clear account of the steps being taken to establish a republic in their native land." Whatever was assumed to be the centerpiece of the presentation soon fell by the wayside as a report following the talk noted that the real eyeopener of the lecture was a controversial remark by the count. A Los Angeles Times article excerpt from 25 March 1917 about protests over Count Ilya Tolstoy's interpreted remarks concerning Jewish speculators and food riots during the March 1917 revolution in Russia at a lecture for the International Institute of Los Angeles at the William H. Perry mansion, Boyle Heights. From the archives Web site of the Times. With a Times headline blaring, "Russian Jews Hoot Tolstoy," the paper reported that Tolstoy remarked, as relayed through an interpreter, that, relative to food riots that had erupted in Russia after the March revolution, "there was absolutely no reason for the food riots in Russia," but that it happened, according to the interpretation, "because the Jew speculators, who were in league with the Russian ministry, had secured control of all other food supplies [excepting, evidently, sugar and some other items which were thrown away to pigs], and were holding them at prices that made it impossible for the people to buy." Tolstoy went on to claim that the ministry was pro-German and that the food price fixing was established to force a peace in the war with Germany. The article continued that, "this statement brought a wild storm of hoots and cat calls that for a brief time created a situation that bordered on riot." The tumult was only quelled when a man went up and, in English, castigated the demonstrators, saying "that they should be the last people in the world to show an intolerant spirit, particularly under the sheltering folds of the flag of America, to which country they had fled to seek an asylum from the awful persecution meted out to their race in Russia." This was a reference to the fact that there had been ongoing pogroms throughout Russia against Jews, most of whom fled for other parts of Europe and the Americas. The piece concluded by noting that, "after this speech, which had a decidedly quieting effect on the rebellious spirit of the Jewish part of the assembly, Count Tolstoy resumed his talk. His remarks from that point on were exceedingly guarded." The Times went on to claim that, while there some 2,500 Russians present, most of whom could not speak much or any English, the demonstrators were functional in that language and that, "their side remarks [indicated they] were all members of socialistic or anarchistic organizations." How the paper arrived at that interpretation, however, was not explained and, given the heightened political atmosphere of the era, these statements should be questioned. Ilya Tolstoy returned to Russia, where in 1915 he started a newspaper called New Russia, after his tour was over, but the Bolshevik revolution forced him to flee and he moved first to Paris and then to the United States, settling in Connecticut. He continued lecturing and did some writing, including reminiscences of his father, but was also forced to sell Tolstoy family valuables to sustain himself. In 1926, Tolstoy came to Los Angeles to consult on two silent film renderings of his father's books. The first was Resurrection, an Edwin Carewe production released in March 1927 by United Artists starred Rod LaRocque and Dolores del Río with Ilya having a small role in the picture. If it seemed strange that a Latina was playing a Russian, Carewe repeated the casting type for this 1931 talkie version, which featured Lupe Vélez. Notably, the first filmed version of Resurrection was in 1909 by D. W. Griffith for Biograph Pictures and included Mack Sennett in a minor role. 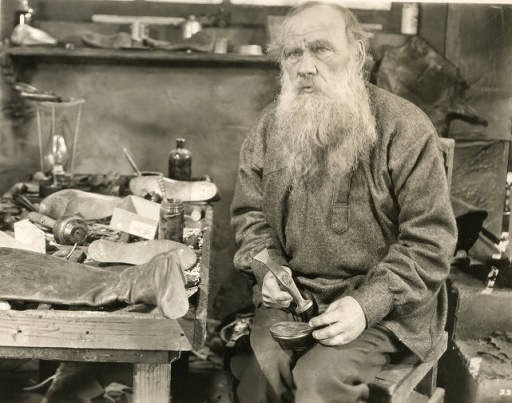 Count Ilya Tolstoy as "The Old Philsopher" in the 1927 film Resurrection, based on his father Count Leo Tolstoy's book, and released by United Artists and Edwin Carewe. From the J. Willis Sayre Collection of Theatrical Photographs, University Libraries, University of Washington. The second movie was an adaptation of Anna Karenina by Edmund Golding for MGM titled Love and starring the red-hot team of John Gilbert and Greta Garbo. Indeed, the original working title was Heat and had Ricardo Cortez in the starring role (here was an attempt to have a Latino in the prime male role as a Russian!) The film was released at the end of November 1927. His short involvement in Hollywood over, Ilya returned to live on the East Coast and died in a New York hospital in 1933. Thanks to Boyle Heights Historical Society Advisory Board member Rudy Martinez for the articles on Tolstoy's talk at the International Institute.